When I first tried to install, I received the following error: “Error 1920. Service EqualLogic Auto-Snapshot Manager Agent (EqlASMAgent) failed to start. Verify that you have sufficient privileges to start system services.” I was running the installation as a domain administrator and tested that I was able to start other system services, so I knew that it wasn’t a problem with privileges. For verification, I tested with the local administrator account and that didn’t work either. I still don’t know exactly what the underlying cause is, but it appears that the installer can’t properly verify the presence of prerequisite components. I installed a series of basic Windows features until I was able to get the HIT kit to install. I did not disable features between attempts so I can’t be certain what the exact required combination of features is, but the last feature I enabled before it started working was the .Net Framework 2.0. From working with a GUI installation of Server 2012, I believe that this is the only required component, but I had also installed Windows PowerShell 2 so I’m including it in the directions just to be safe. I also noticed that the HIT kit didn’t automatically enable MPIO like it does on 2008/2008 R2. 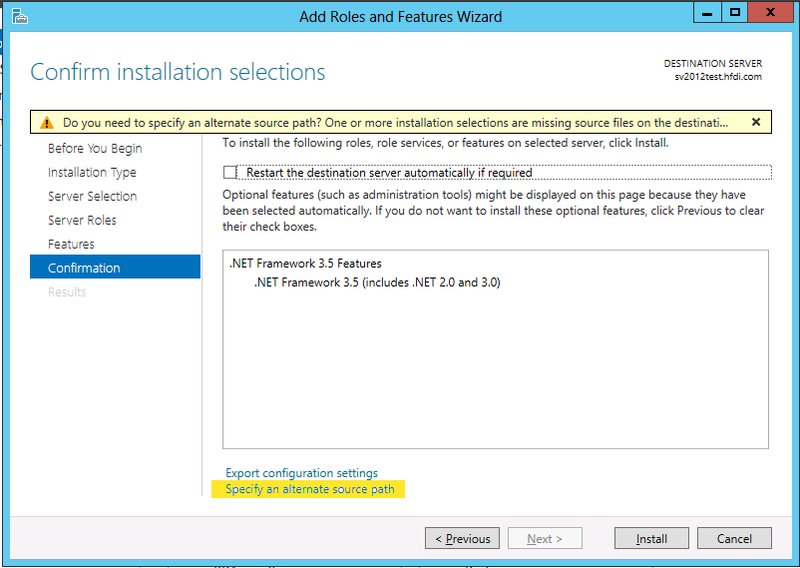 Installation within a GUI version of Server 2012 isn’t as easy because the .Net Framework 2.0 isn’t a standalone installer. It’s part of the 3.5 installer, and Microsoft has removed that from the online image (why?). You’ll need your Windows 2012 DVD. You can find command-line instructions on the ServerFault site. 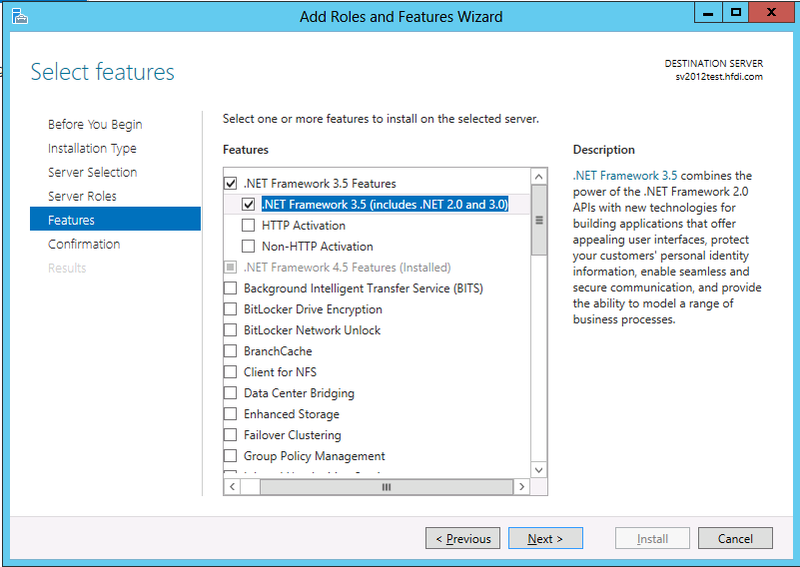 All that’s done is the box for .Net 3.5 has been checked but both activation methods are left uninstalled. You’ll be presented with a very wordy dialog box, not shown here. At the very bottom, enter X:\sources\sxs, where “X:” is your DVD drive letter. The installation of .Net will take a few minutes. After that, you’ll have no troubles installing the HIT kit. Remember that it does not automatically enable MPIO! If you used the Server GUI method shown above or the link on ServerFault, you’ll need to go back and enable MultipathIo. It’s on the same screen that you used to install .Net 3.5, or you can modify the line I presented to install on Server Core/Hyper-V so that it only enables MultipathIo and run it from a PowerShell prompt. Dell EqualLogic Host Integration Tools for Microsoft® v4.5 Early Production Access now available on the Dell EqualLogic site for download. Thanks, Andrew, for your continued support of Dell EqualLogic and for updating this thread. Please let us know if you need anything else. Dell EqualLogic Host Integration Tools for Microsoft® v4.5 Early Production Access now available on the Dell EqualLogic site! Dell EqualLogic Beta Software should not be used in a production environment – regardless of the target / installed OS. The Dell EqualLogic SAN HeadQuarters software, a SAN monitoring solution, is an exception and can be installed in production. Thanks, Andrew, for your interest in Dell EqualLogic. Starting from HIT Kit 4.0 your host needs internet connection. ASM service needs internet for a certificate download on the first start. But only during first start, so the connection can be dropped after the service came up for the first time. The message can be safely ignored during installation. Thank you for your support of Dell EqualLogic. It’s hard to be certain from your description. But, I suspect that you are trying to install a version of HIT/Microsoft that does not support Microsoft Windows Server 2012. What version are you installing? Dell EqualLogic Host Integration Tools for Microsoft v4.5 Beta Refresh 2 was released last week and includes support for Microsoft Windows Server 2012. Your guess is correct. I used version 4.0 of the HIT Kit. I didn’t see any pre-release versions when I was downloading, but if it was last week then I either just didn’t see it or missed it by no more than a day or two. Now that 4.0 is installed, everything is working fine. It sets up multiple sessions properly and I’m not having any problems with the virtual machines living on the SAN. I do look forward to the official release of 4.5. Thanks for the update! where can we get the Dell EqualLogic Host Integration Tools for Microsoft v4.5 Beta, it was talked about by Dell here :-http://en.community.dell.com/dell-blogs/software/b/software/archive/2012/06/11/dell-announces-equallogic-software-updates.aspx, but still no sign, we’ve had a Equalogic SAN from July 2012, which we still cannot go forward with our Hyper-V 2012 Cluster Project, because of no software! So 14TB sat here, turned on of no use! Agreed. I haven’t seen where we can actually get 4.5 either. It’s not showing under Early Production Access as I’d expected it to based on the above comment. However, I have not yet encountered any problems running Hyper-V 2012 on HIT 4.0 as mentioned in the article. I can understand why you wouldn’t want to run 4.0 on unsupported Hyper-V version in production but it doesn’t seem to be significantly different than running an unsupported beta in production. biggest issue is any rework required later to move to HiT 4.5. I could setup everything manually, but once any configuration is complete, its likely to stay like this in production for a very long time. And then once this large cluster is complete, it would be difficult to get the downtime, to change, in a 24/7 environment. Management has signed off on the Risk of Production on Unsupported Dell Servers, no current Dell drivers for 2012, and Beta 4.5 HiT, for Production. What do we do if we want a production WinServ2012 box? Put BETA HIT kit on? Also, even with WinServ2008 R2, I would get that same permissions error about starting the service if installed on brand new box. Installing all the patches seem to let it work right. when can we expect Production Support of Windows 2012 and Hyper-V, eg when does HiT 4.5 go GA? We have a SAN sat here gathering dust, since July 2012? and I still do not see any progress…. Microsoft announed Windows Server 2012 General Availability release last month (September 2012). So, the Dell EqualLogic Beta Program for HIT/Microsoft v4.5 Beta Refresh 2 has now ended and Dell is preparing for the HIT/Microsoft v4.5 Early Production Access release. Stay tuned to the Dell EqualLogic Customer Suport site for availability.